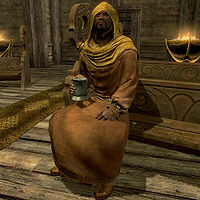 Maramal is a Redguard priest in the Temple of Mara, located in Riften. Maramal is usually found either in the Temple or walking around the city. He is also found, occasionally, in the Bee and Barb. Maramal is also the only NPC who can give you the option of marrying another character, via a specific ritual. It should be noted that you must receive the quest from Maramal before you can wed another character. Upon your first visit to Riften, Maramal can be located at the Bee and Barb. There is a scripted scene of him preaching that is activated upon your entrance into the inn. Until then, he will not leave and cannot be found anywhere else. Maramal wears a set of hooded monk robes along with a pair of boots. He carries a belted tunic along with a selection of common loot and gold. In combat, he wields a staff of banishing, a staff of the frost atronach, or a staff of revenants. He knows the Destruction spell Flames and the Restoration spell Lesser Ward. Any gold you donate to Maramal will be stored in the chest in front of the altar, but you will not get The Gift of Charity, nor are there any other effects. This page was last modified on 8 March 2017, at 21:51.